At some point after that, I began making bases for my Putz houses and churches from greeting cards. It has become my trademark for the Putz houses and churches I sell on Etsy. 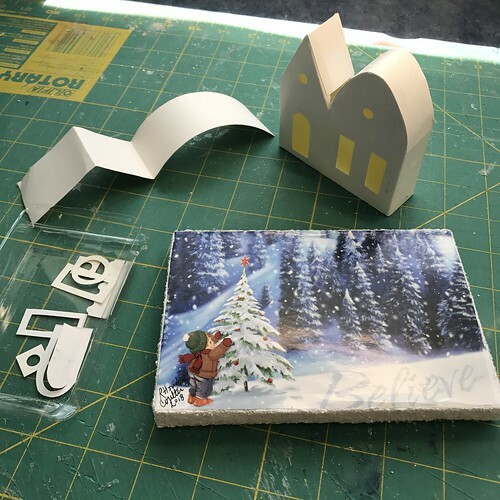 This tutorial is an updated version of the first base tutorial, specifically explaining how I use a greeting card as the base. I hope you will enjoy giving this method a try! 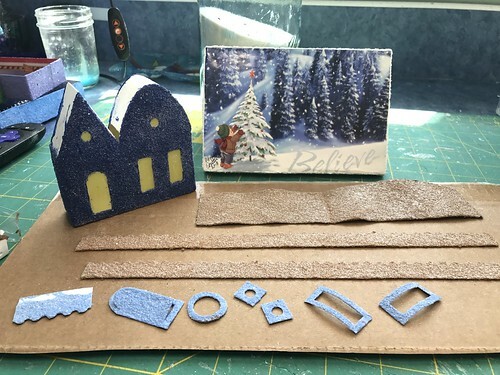 I like using greeting cards to make the bases so each of my houses has a surprise on the bottom. 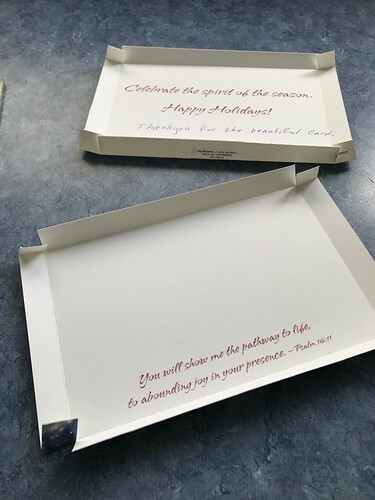 When you lift the house and peek underneath, you will find a greeting card picture. I try to coordinate each house with the picture on the base. 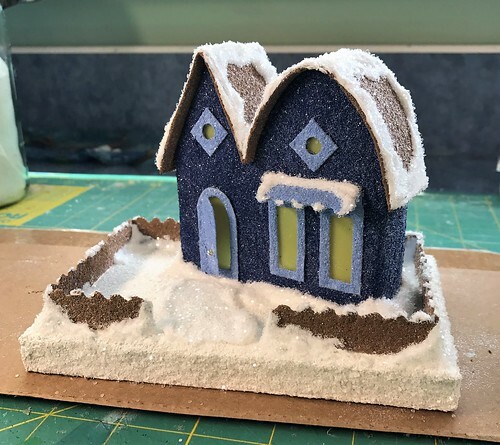 This is the Putz house I made for the base I constructed to illustrate this tutorial. 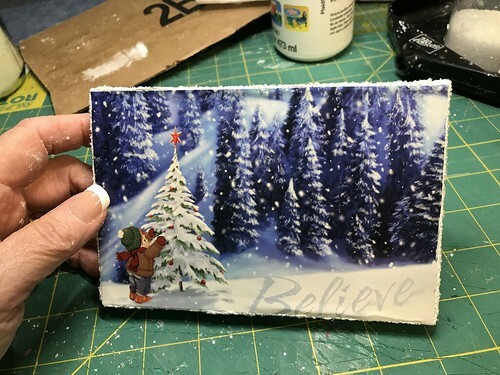 This is the bottom of the base, showing the Christmas card I used to make the base. an assortment of greeting cards to choose from. You will need one per base. Regarding sand: I add sand to my paint mixture because it adds the texture seen on many vintage Putz houses. It will eventually ruin a paint brush, though, so use a cheap paint brush if you are using sand. 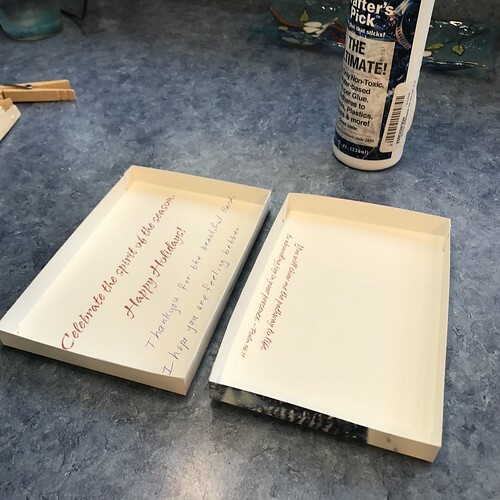 The first part of the process is to make a box from a greeting card. 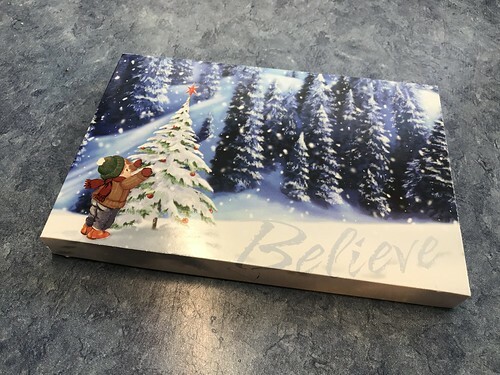 Keep in mind, that when you make the box, you will be making the top of the box from the picture side of the card and the bottom from the back of the card. 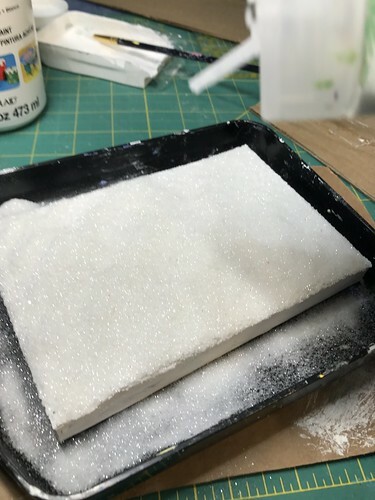 However, when you make that box into a Putz base, the top becomes the bottom, which means the box will be upside down so you can see the picture when you tip the house up a bit. I have found that the box as a base works best if the gap between the top of the box and the bottom of the box is facing up. It’s easier to hide when you paint the box. Trust me on this. You will see what I mean as you make a base. 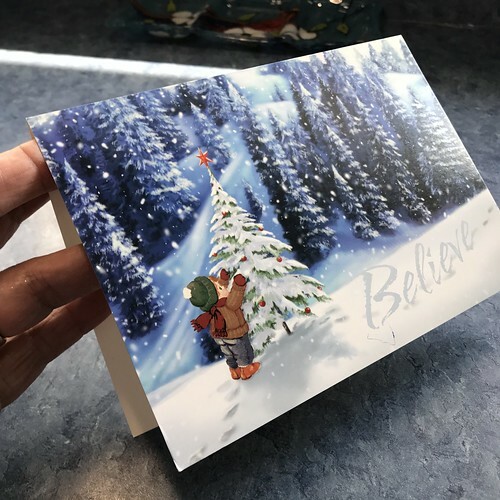 To begin, choose a greeting card that you like. Or you can practice on cards you don’t like! Keep in mind that the picture on the front of the card will lose a border all the way around. 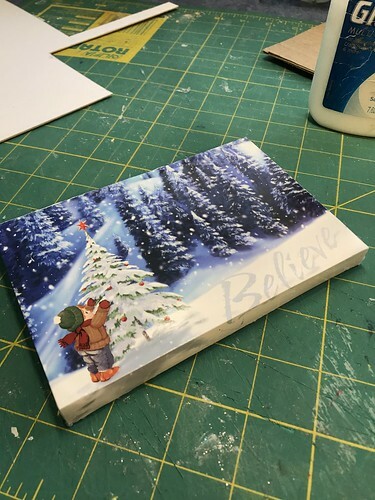 If the sides of the box you’re making are 1/2″ tall, the picture will lose 1/2″ all the way around. Some cards won’t be usable. 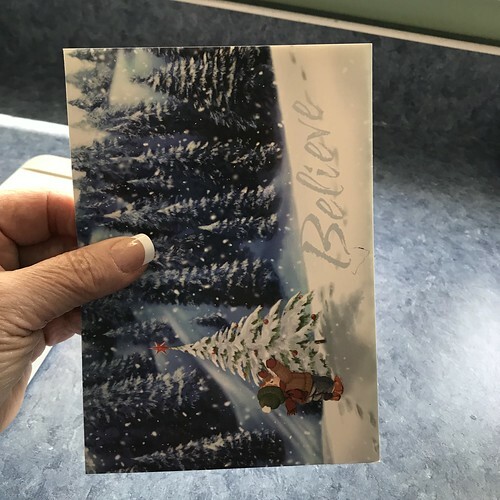 For instance, if the card has a Christmas tree on it and the star at the top is right up to the edge of the card, the resulting base may show a tree, but no star. 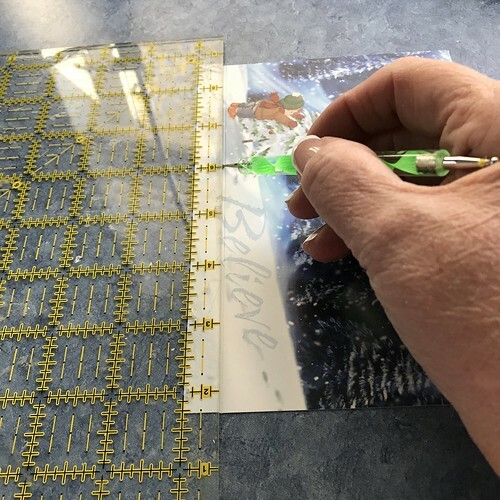 It can be useful to make a 1/2″ guide. 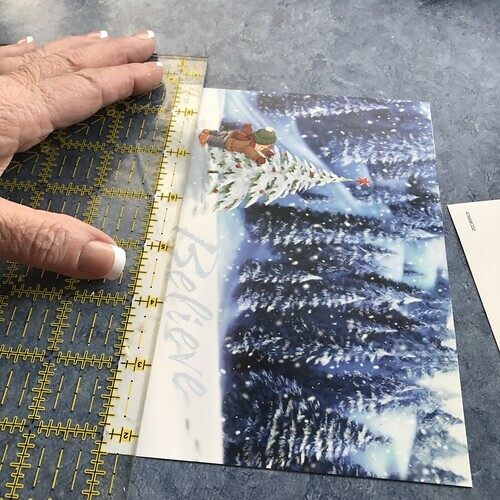 Two L-shaped pieces of cardstock, with both legs of the L 1/2″ wide, can be placed, overlapping on the face of the card, to show you just what will show on the finished box top. 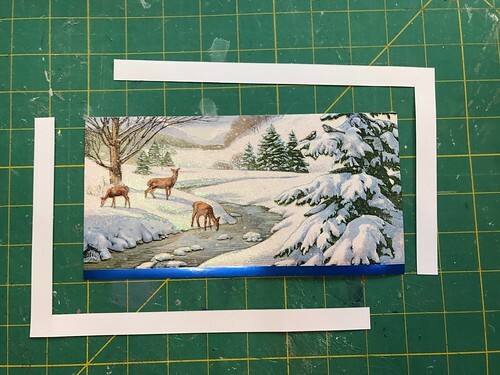 In this example, you can see the guides I made and the greeting card I am thinking of using. With the guides in place, you can see that the sides of the finished box will cut the deer’s head off, which won’t look good on the finished base. 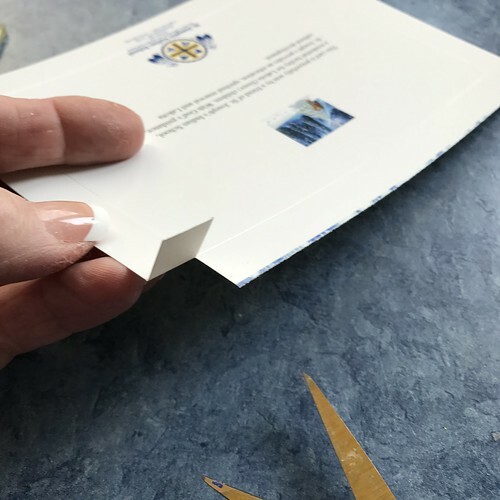 Sometimes cutting a feature from the card is fine. In this picture, you can see that the words have been cropped from the right side. This card didn’t have enough leeway all the way around to leave all the words visible. To me, this can be charming, as in this example. But some cards can lose too many important pieces of the picture to be usable as a base. I often make bases in a batch, several at a time. 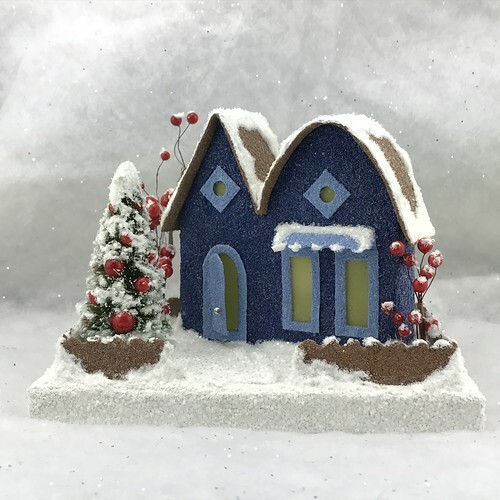 I choose cards I like and then, when I’m ready to make a Putz house, I choose a house or church pattern that I think will coordinate with the picture on the pre-made base, and I choose the colors for the house or church from the colors in the picture on the card. 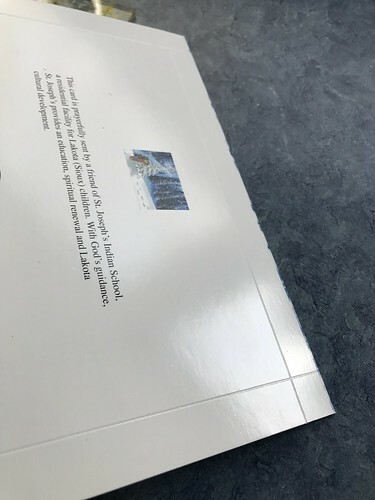 Cut the front of the card from the back. Cut along the fold. 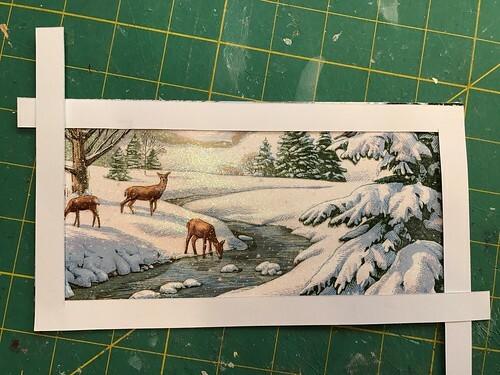 I like to make the cut so the front of the card doesn’t have any part of the fold on it when finished. 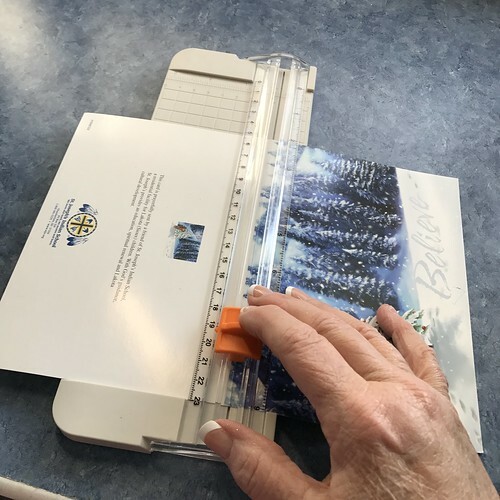 A paper cutter like the one pictured makes a straight clean line, though you can use scissors if you don’t have a paper cutter. Hold the card with one hand as you slice with the other, to keep the line straight. Hold the pieces together, line them up and see if they are the same size. The next step is to score the sides. 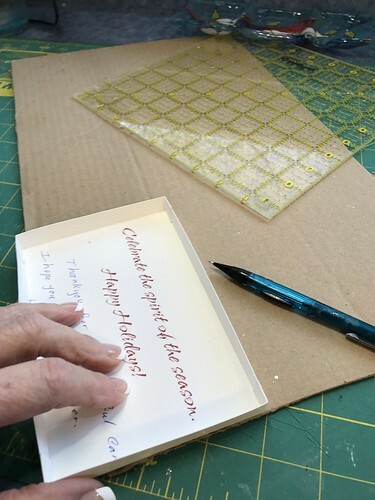 Place the ruler over 1/2″ of the side of the card. When scoring, hold the ruler down tightly so you make a straight score line. 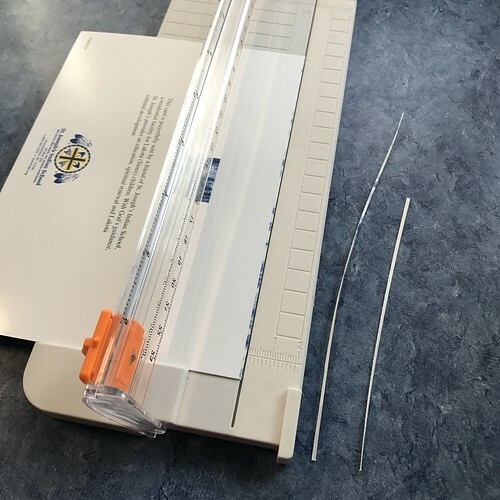 You can use a small ball stylus tool, as I’m using in the following picture, or a bone folder or other blunt object that will make a narrow crease in the face of the card. You don’t want to cut all the way through the card. 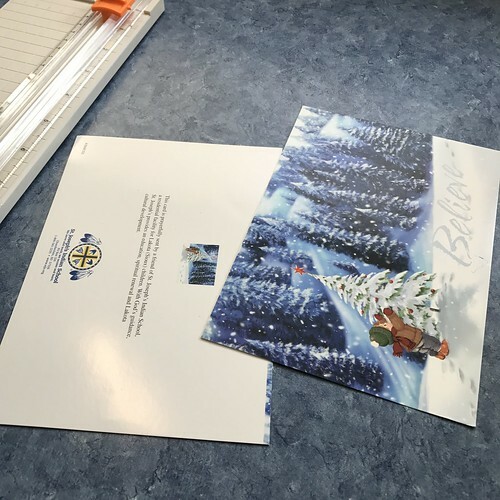 The purpose of the crease is to make the card stock easy to fold along a straight line. 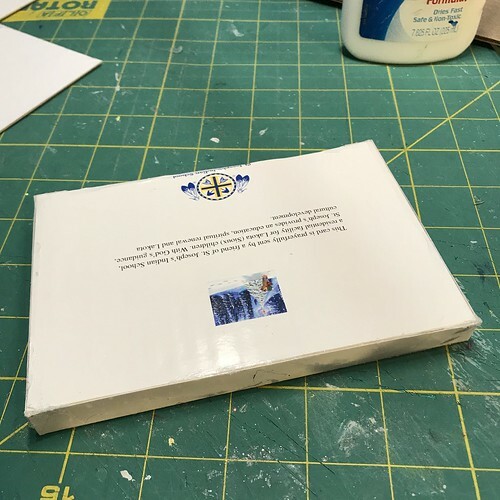 My default base is 1/2″ thick, but they can be as thin or as thick as you want to make them. 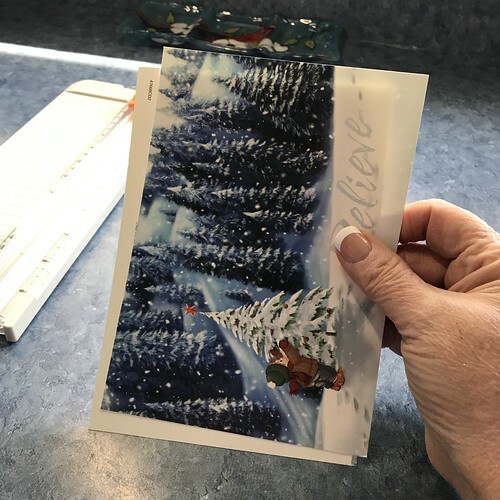 Sometimes, I make them 1/4″ thick or 3/8″ thick, if the picture on the front of the card requires that to get an important part of the picture included in the finished piece. Score all four sides of the front and all four sides of the back of the card. This picture shows the crease lines made by the scoring tool. 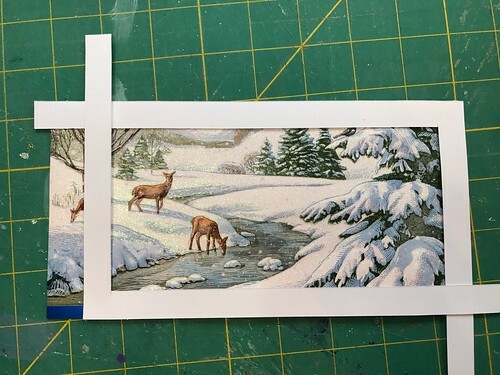 Cut into the long sides of both the front and back of the card, from the edge, along the crease line, just to the crosswise crease line. I always make these cuts on the long sides of the cards so the resulting flaps will be glued to the sides of the box and not to the ends. You’ll see what I mean as you go along. Fold all the creases toward the inside of the box. 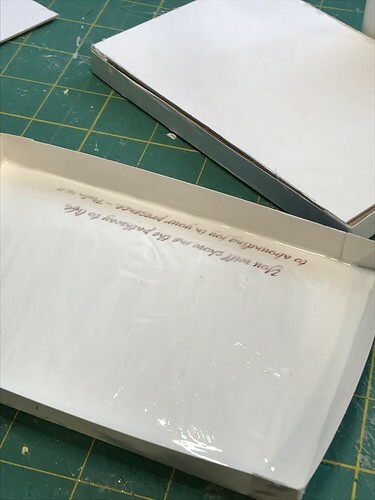 Use white glue to glue the flaps to the inside of the box. Clothespins make great clamps. 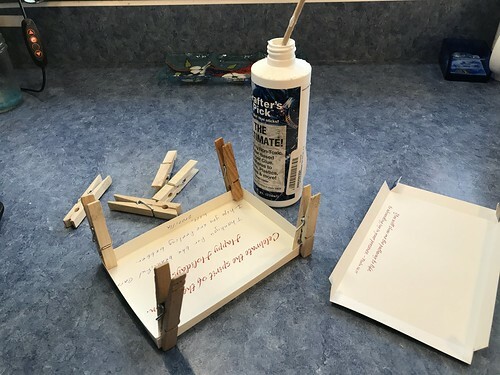 If the glue dries to the clothespin, just wiggle it back and forth till it lets go. Finished box, top and bottom. Put it together to be sure it fits well. Don’t leave it together for long, though, in case there is a dab of wet glue that will dry and lock your box shut tight…BTDT. 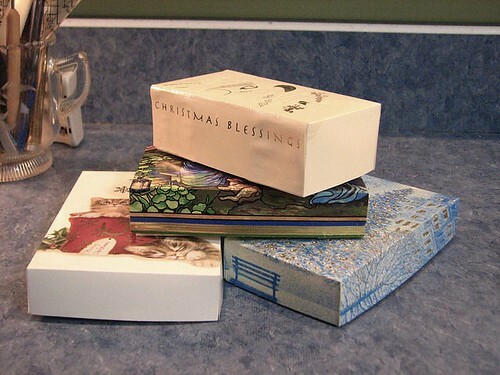 Side note: These Christmas card boxes make great gift boxes for small items. 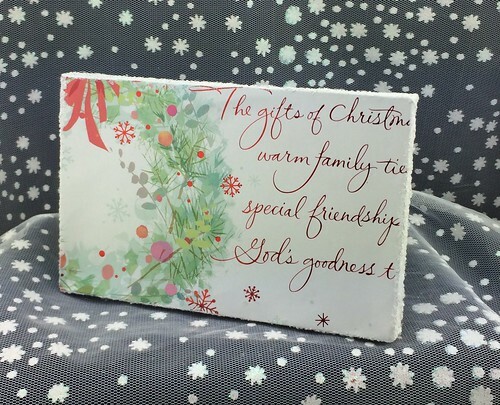 A box can be made with one-inch sides and it will hold an ornament or candy or other small item. No wrapping paper needed. Tie with a ribbon and it’s good to go. The next phase is filling the box to make it sturdy. I use corrugated cardboard from shipping boxes like ones I get in a steady supply from Amazon. Use the BOTTOM of the box to measure the cardboard. I have to set the top aside so I don’t accidently fill it with cardboard. Once that’s glued in, there’s no taking it out if it has been glued into the top of the box. Other items can be used as filler. Styrofoam sheets would probably work, other kinds of thin cardboard, foamcore board, etc. Corrugated cardboard is free and I like the stability it gives the base. 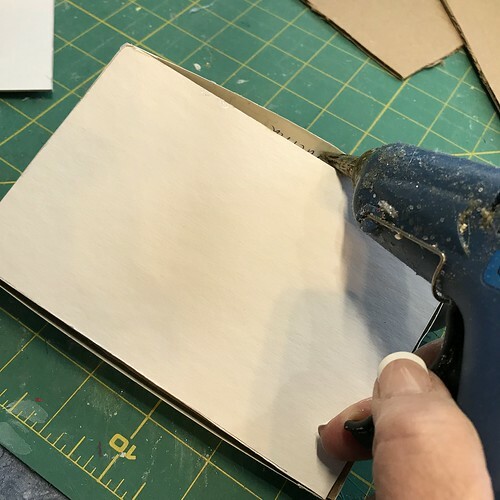 I use a box cutter to cut my cardboard pieces, but you can use a craft knife, Xacto knife or scissors. If it’s too big, like this example, just trim it down till it fits. Don’t force the sides of the box wider than they should be or the top won’t fit well. 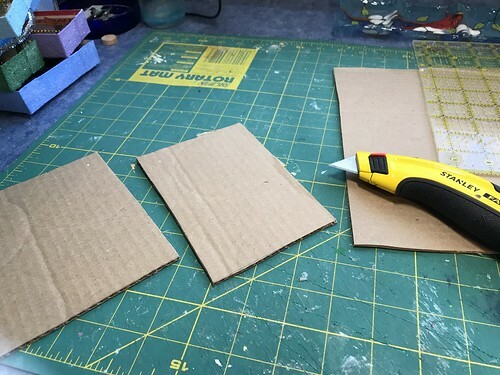 When you have a piece that fits well, you can use it to trace two or three more pieces of cardboard. 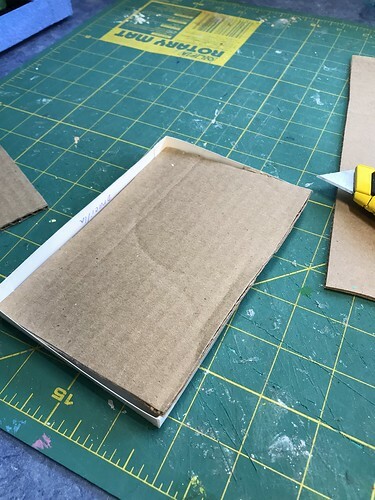 I spread white glue over the inside of the bottom of the box, then place the first piece of cardboard. 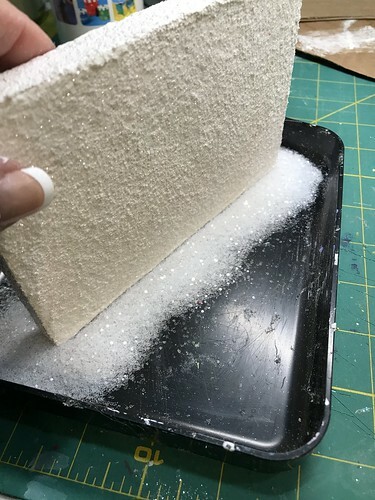 I use hot glue between the cardboard layers. 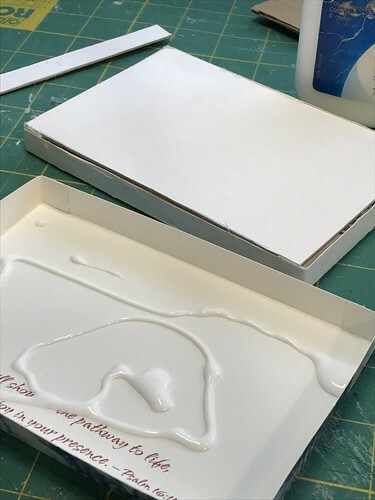 If you use hot glue on the box itself, you may see the lines of hot glue through the box, on the outside, when it has hardened. Usually four pieces of cardboard fill a box perfectly for me. But, sometimes, like this example, you may need a bit more filling, but another piece of the same cardboard would be too much. When this happens, I cut the last piece from poster board. One layer is usually all I need to fill the box properly. You can see the white posterboard here. And now it’s time to glue the sides with some hot glue. I run a bead, one side at at time, just inside the box. I hold the box up on its side with the glued side down on a piece of scrap cardboard till the hot glue sets. 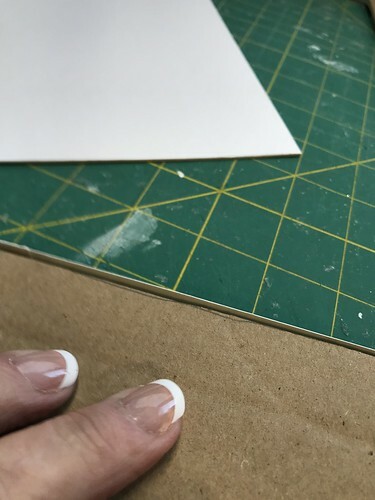 If it runs out the gap when pressed on the scrap cardboard, just swipe it while still melty to leave a smooth finish. 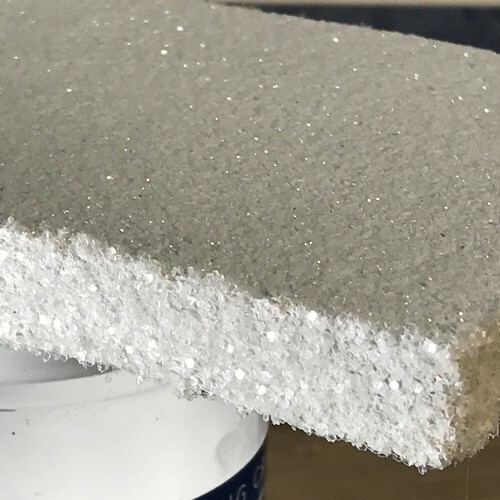 You don’t want any glue bumps hardened in place. It’s time to put the top of the box on. Again, white glue on the inside of the box. Smooth it out in an even layer. 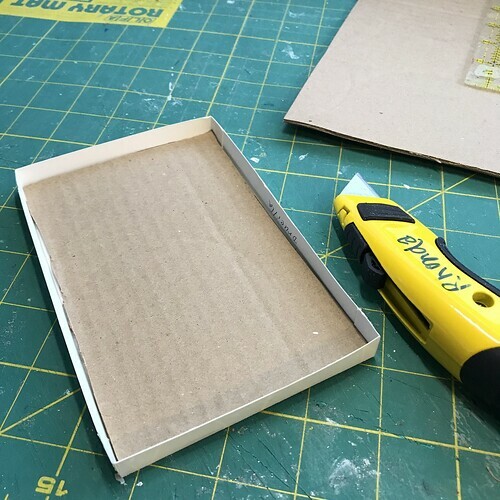 Fit the pieces of the box together and press the top of the box lightly to be sure the glue adheres the top of the box to the top of the cardboard filling. I usually turn it upside down on my work table and press it gently. The construction of the base is now done. The next step is to turn the box over and check for gaps. This particular box came together very well. 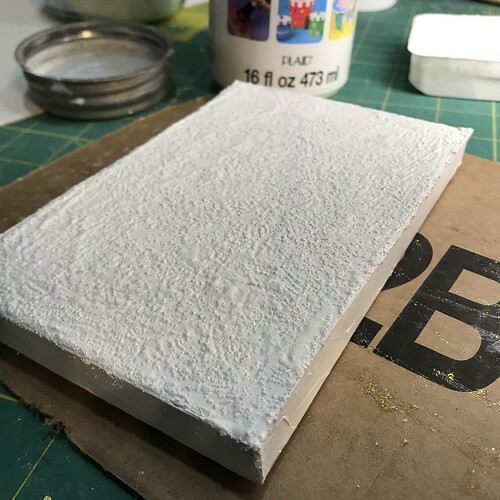 When there are gaps, I use Golden Molding Paste to fill the gaps as smoothly as possible. After half an hour or so, when it is dry, I sand it smooth with a nail file. When any gaps have been filled and filed smooth, it’s time to paint the base. As you can see, what was the bottom of the box, is now the top of the base. 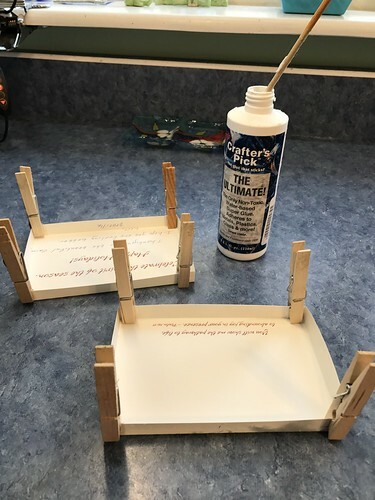 I give the top of the base and the sides of the base a coat of white acrylic craft paint and let that dry. Then I give just the top of the base a second coat with my paint mixture. I mix the acrylic paint 1:1 with white glue (I use Elmers). A couple of tablespoons of paint to a couple of tablespoons of glue. No need to measure exactly. Just eyeball it. I like to add a teaspoon of paint conditioner like Floetrol to make the paint slide on smoothly. That’s totally optional. Stir the paint mixture well. Then, stir in about two teaspoons of fine sand (like playground sand). Give just the top of the base a coat of the sandy paint mixture. Let the first coat of the paint mixture dry. 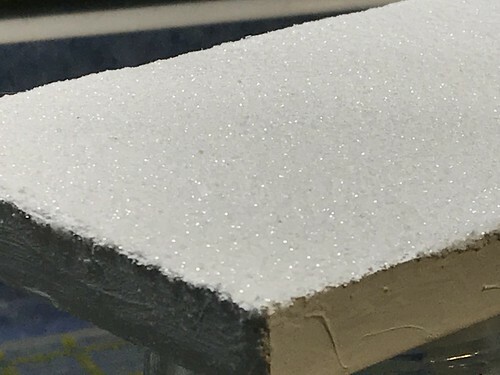 Paint on a second coat and, while the paint is wet, sprinkle the fine glitter over the top of the base. Tap off the extra glitter and let the paint dry. To paint and glitter the sides, I use the same paint mixture over the base coat of acrylic paint. I do one side at a time. Let the first coat of the paint mixture dry, then add a second coat. While the second coat of paint mixture is still wet, set the side into the glitter of your choice. I like to use a coarser glitter on the sides as a contrast to the fine glitter on the top of the base. Once the base is completely dry, it’s time to add a house. When it’s time to glue the house to the base, check the picture and be sure it is oriented in the right direction when the house is tipped backward to see the picture. I’ve had to pry houses off bases after I had them glued down because the base was turned the wrong way. Not fun! Check first. Glue second. 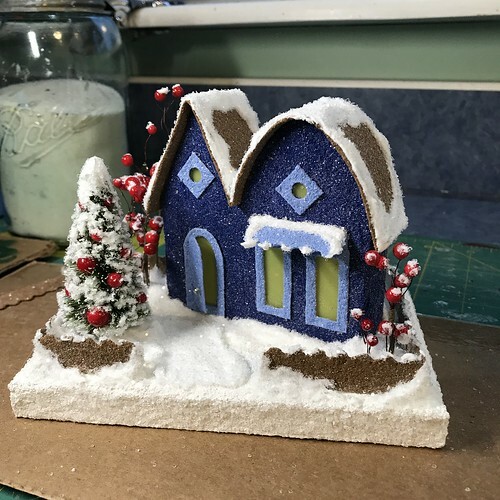 I appreciate your comments and I am happy to answer questions you may have about the process of making a base or about any of the other bits and bobs of making Putz houses. It’s a wonderful hobby and one, I am sure you can tell, I enjoy a great deal! This entry was written by ~~Rhonda, posted on April 22, 2018 at 2:47 pm, filed under Putz / glitter houses. Bookmark the permalink. Follow any comments here with the RSS feed for this post. Post a comment or leave a trackback: Trackback URL. What a wonderful tutorial. Rhonda, it is so well-written and easy to follow. Thank you for taking the time to do this. Thank you for this tut, it is helping me greatly. I saved little snippets and highlighted the tips like double checking the direction of the picture. That is something I would totally do backwards. Thank you for this informative tutorial filled with tips of the trade. I am mustering up courage to start my first house, and will try this idea! Love it, and thanks for your generosity.